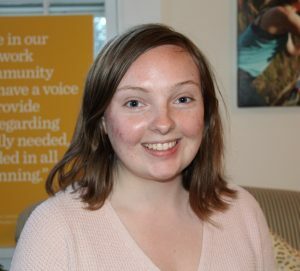 Emma Ronai-Durning 19’ reflects on her CCE Community Engagement Academic Outreach Endowment (AOE) grant funded employment with Rural Organizing Project. This summer, thanks to an Academic Outreach Endowment Grant, I was able to return home to Oregon and work with the Rural Organizing Project. My summer was full of new projects that challenged me and enabled me to grow as a human and as an organizer. I started the summer researching how to file public records requests. My goal was to create resources for folks across Oregon so that they could carry out their own research into what was going on in their communities in regards to police-ICE (Immigration and Customs Enforcement) collaboration. As I discussed in my initial project proposal, this practice of providing the tools of research to those who might not otherwise have access to them aligned with my spring semester’s geography course, which explored radical geographic pedagogy quite extensively. More personally, it was exciting to see how the work of so many different fields can come together for a common cause. In my research I worked with activists, immigration lawyers, public defenders, immigrant justice organizers, and criminal justice advocates to figure out how to best file public records requests in the state of Oregon. It also confirmed in me the answer to a question I often receive from family members and family friends: “No, I do not want to be a lawyer.” While I deeply appreciate the assistance I received from those with legal training, I feel much more motivated to work with people at a community-wide scale instead of on a case-by-case basis. This summer provided me the opportunity to gain more clarity on my goals beyond college, while also becoming a more skilled and experienced organizer, so as to better fill that role in the future. You can read the resources I created on Public Records Requests here: a story of how records requests can be used as one tool in the toolbox, and a nitty-gritty how to. 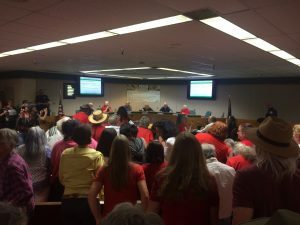 The Springfield City Council ending their jail’s contract with ICE (thanks to multiple packed hearing rooms and months of local organizing). This entry was posted in Midd Blogosphere and tagged Student Stories, Uncategorized on September 17, 2018 by Jocelyn Tenorio. 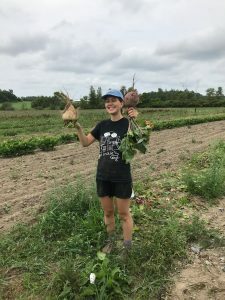 Nora Peachin ‘21, employed through the Middlebury FoodWorks Fellowship this summer, reflects on her experience as the Local Food Access Intern at HOPE. This summer, I worked at HOPE (Helping Overcome Poverty’s Effects) as the Local Food Access Intern. HOPE assists low income individuals in Addison County in identifying and securing the necessary resources to meet their basic needs. HOPE’s food shelf is the largest in Addison County and serves over 600 people every month. Some of the food HOPE provides its clients is donated by local farms and stores. As the Local Food Access Intern, I helped my supervisor, Lily Bradburn, do on-farm pick-ups and gleans, plan and teach cooking workshops, prepare educational materials on local food, and organize other outreach efforts. During my ten weeks at HOPE, I came to better understand the realities of poverty in this county. I learned about the complexities and contradictions of nonprofit work — for example, the constant struggles of finding a balance between helping people and helping them help themselves, of avoiding telling people what they need in place of asking them, and of budgeting an organization’s limited budget fairly. All of this forced me to question some of my beliefs about poverty and poverty relief efforts, and to rethink how I approach nonprofit work. As a result of my work, I now feel more in tune with the local food system and local community. I was able to experience first-hand how the many organizations in and around Middlebury work together to address issues like poverty, homelessness, and hunger. I got to see and hear about the struggles many farmers are facing and their efforts to overcome them, as well as their great achievements and contributions to the community. My internship gave me the opportunity to break out of the Middlebury College bubble, and to connect with and learn from many individuals doing inspiring and important work in the county. I am so grateful for Lily and all the other wonderful staff at HOPE, for FoodWorks director Sophie Esser-Calvi, for Tiffany Sargent, James Davis, Rachel Roseman and Liz Cleveland at the CCE, and for all the other FoodWorks and Privilege & Poverty Interns for shaping my summer in Middlebury. Nora Peachin ‘21 with some of her gleaned crops. This entry was posted in Midd Blogosphere and tagged Student Stories, Uncategorized on September 3, 2018 by Jocelyn Tenorio. Rural Fun Delivery (RFD), a Mary Johnson Children’s Center program, provides free, healthy lunches and engaging summer programming to kids 18 and under in mobile home parks in Starksboro, Vermont. Last summer, RFD expanded to offer afternoon activities on Tuesdays, Wednesdays, and Thursdays and provided each site with a Little Free Library full of books donated by local non-profits. Eight weeks into my internship, I am thrilled to be a part of RFD’s fifth summer delivering food and fun to the kiddos in Starksboro. I began my internship with RFD by planning activities for the summer and preparing promotional materials with my co-lead intern Lily Barter ’19.5, in addition to helping out with the Mary Johnson Children’s Center’s after-school program at Middlebury’s Mary Hogan Elementary School. Having served with Middlebury College’s Page One Literacy Project, I was especially excited to build on the existing Little Free Libraries and offer a new summer reading challenge to help foster a love of reading. We began delivering lunches – prepared by the Mt. Abraham Union School District – three weeks into my internship and centered that week’s activities around community. That included playing blob tag and creating a collaborative poster! We have since traveled through space, explored nature, and transformed into superheroes. This is currently our fifth week and we are going under the sea by learning the classic game Captain’s Coming, creating slime, and perfecting our water balloon toss. I have greatly enjoyed building relationships with the kids so far – getting insider knowledge about all the animatronics in the video game Five Nights at Freddy’s, meeting a fantastic group of stuffed animals, and discussing our favorite superhero movies. I look forward to drawing from my experience with RFD in my work with Middlebury’s Page One Literacy program and in future non-profit work with kids. I am so grateful to Anne Gleason, Director of School Age Programs at Mary Johnson, for this opportunity and to Lily for her creativity and enthusiasm. This entry was posted in Midd Blogosphere and tagged middleburycollege, News & Events, privilege & poverty, Student Stories on August 3, 2018 by Jocelyn Tenorio. This blog post is a reflection from Chloe Fung about her participation in the Japan Summer Service-Learning Program (JSSL). In the beginning of July, we started the JSSL program with 14 students- four from Middlebury College, four from ICU (Japan), two from Assumption University (Thailand), two from Silliman University (The Phillipines), and two from Union Christian College (India). In the past two weeks, we’ve visited different communities in and near Mitaka city, including elderly homes, public elementary schools, and an urban blueberry farm. We’ve cut down bamboo plants for a Nagashi Soumen event, cleaned the classroom floors after school lunch with sixth graders, made takoyaki and tempura with host families… The program has given us an opportunity to glimpse into the lives of local people, which would not otherwise be easily accessible as a foreign tourist. Last week, our group visited two public elementary schools, Minamiura and Higashi. At the elementary schools, we participated in the activities prepared by the English teachers and also helped prepare for future activities. I was struck by the difference between the atmosphere and structure of the school compared to schools I had experienced or seen before. In my view, the students’ had learned a sense of responsibility already at an early age. This was most clear during lunch time, when all the students would prepare the classroom for lunch, bring food in from the kitchen, pass out food, and make sure everyone had a meal set on their desk. After lunch, students spread out to clean the classroom and also other rooms in the school. Even without explicit instruction or supervision, every student went to perform their assigned task. That diligence to me was incredible to see for sixth graders. Experiences like this have inspired me to reflect on my own schooling experiences, started discussions with others in the program about Japanese culture, group norms, and English education, and also taught me more about group dynamics and teamwork. Whether it is cleaning classrooms with children, working with native English, second-language English, and native Japanese speakers in translating materials or having cultural comparisons about the streetside farm stands that run on an honesty system, I have been learning a lot about myself, the different experiences of other program students, and about Japanese culture. I am looking forward to future fruitful discussions and to going to Tenryumura soon and experiencing a potential cultural shift as we move into a rural space with an aging population. 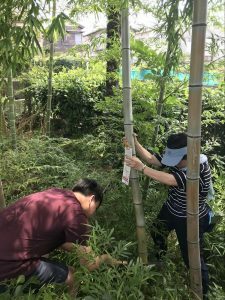 One of the Familia staff and a fellow program participant cutting down a bamboo plant for Nagashi Soumen. 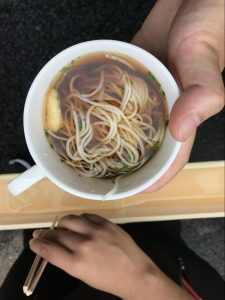 Soumen (a kind of Japanese noodles) during the Nagashi Soumen event. In the picture, the bamboo is also pictured. In Nagashi Soumen, noodles are placed in the cut open bamboo plant while water is run through the ‘bamboo channel’ so that people stationed along the bamboo can try to catch some noodles with their chopsticks! 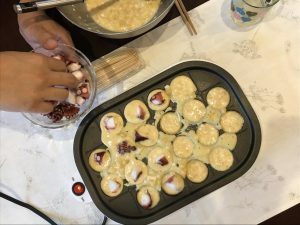 Making takoyaki with a local family who hosted us for the evening. 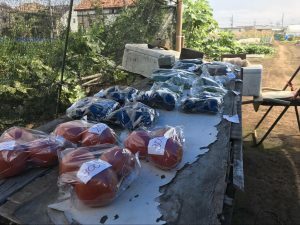 As we walked past this farm stand that ran on an honesty system (where there is no shopkeeper and customers place their payment into a box), we all had some laughs and interesting conversations about how this would not be feasible where we were from! This entry was posted in Midd Blogosphere and tagged Student Stories, Uncategorized on July 26, 2018 by Jocelyn Tenorio. 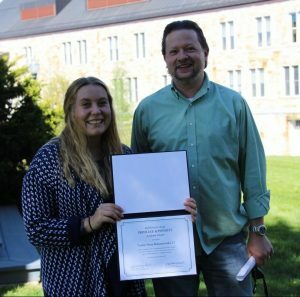 This blog post is a reflection from Taylor Banaszewski ‘17 about her completion of the Privilege &Poverty academic cluster and how it has impacted her current work post-graduation from Middlebury. During my senior year, I sifted through dozens of jobs trying to find a career path that would tie all my interests and passions together. I knew I wanted to positively impact the lives of others and I always had a strong interest in financially stability. I never imagined myself working at a bank, but I found being a Relationship Manager at Bank of America to be the best fit. One of Bank of America’s goals is to positively impact the financial lives of its consumers and as a Relationship Manager, I am one of the first faces a client sees when walking into a financial center. I am the person a client would go to with any questions they might have regarding their finances. While being in this role for over a year now, I can see how completing the P&P academic cluster has helped me become a better relationship manager. During my summer internship through Shepherd Higher Education Consortium on Poverty at Foundation Communities, I was able to explore my interest in financial literacy by working at a nonprofit that provided financial coaching. I was able to see how having somebody help you through setting a budget and explain credit to you can make a real impact in the lives of a person who is struggling financially. It is so important for that person to have somebody supporting and helping them through the process. The P&P academic cluster allowed me to explore these interests further in the classroom and conduct my own research on consumer debt for my senior thesis. As a Relationship Manager, I frequently find myself in situations where I am educating clients in regards to credit, savings, and borrowing funds. I help clients use the budgeting tools Bank of America provides to help them set goals and I set follow up appointments with clients to check in on their progress. I am using my position at a bank to become a trusted advisor to my clients while also helping increase their knowledge on various topics. I still strongly believe that financial literacy is a big issue and we need to be doing more to educate everyone on the basics of budgeting, credit, loans, etc. We don’t traditionally think of banks as having the responsibility of being an educator, but I use my role within my organization to educate people whenever I have the opportunity. The knowledge and experience I gained through the P&P Academic Cluster has been essential in helping me positively impact the lives others through my career. This entry was posted in Midd Blogosphere and tagged Student Stories, Uncategorized on July 20, 2018 by Jocelyn Tenorio. Nutrition Outreach and Mentoring (NOM) is a student service organization with the goal of creating community and connecting people through food and food education. The student-run group organizes volunteer events and classes with the purpose of teaching people how to cook healthy food for themselves on a budget and to acquire the independence and knowledge that comes with this life skill. The aims of these initiatives are to establish healthy eating and cooking habits and to raise awareness about nutrition and current food issues. This week’s student leader spotlight is Maddie Maloney ’19, the president of NOM. Why should folks join NOM? What will they take away from the experience? Folks should join NOM because it is a fantastic opportunity to create meaningful connections with some very adorable kids while teaching and facilitating healthy eating habits. 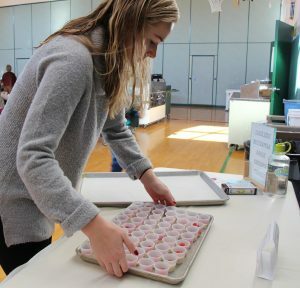 Volunteers will walk away from taste tests and other NOM programming having served healthy fruits and vegetables according to the Vermont Harvest of the Month calendar , or having provided educational nutrition lessons that will positively affect members of the Middlebury community in the long-term. Why did you first join NOM? I joined NOM because I believe that constructing positive relationships with food is essential to long-term health, well-being, and happiness. I found my own path to a positive relationship with food during the transition from high school to college, and I joined NOM because I wanted to both share this experience with others and assist the youngest members in our community in enacting lifelong healthy eating habits. I firmly believe in the power of preventive medicine and the role that nutritious food plays in protecting and maintaining health. Finally, I so appreciate the opportunity to connect with members of the Middlebury community and create meaningful relationships. What has been your most memorable experience as a member of NOM? My most memorable experience as a member of NOM was this past March when we had a maple syrup taste test at Mary Hogan. The fabulous team at Mary Hogan found a way to make this month healthy by cooking maple-roasted turnips, which were a HIT! As in, so much of a hit that we had children swarming our volunteers for sixth, seventh, and eighth servings of the turnips. Not only was it hilarious to watch the elementary schoolers chase our volunteers around with their trays of samples, but it was incredibly rewarding to hear that many of the kids really liked a food that is not typically kid-friendly, and wanted their families to make them at home. What have you learned, either about yourself or the world around you, as a member of NOM? As a member of NOM, I have learned the value in creating and maintaining relationships with members of the greater community. It can be easy to get caught up in everything that happens on campus (especially when we are all so busy! ), but I have learned that it is incredibly beneficial for both Middlebury students and the kids we work with alike when college students are really involved in the community. I am a Molecular Biology and Biochemistry major with a Global Health minor from Newton, Massachusetts. In addition to being the president of NOM, I am a research assistant in a biology lab on campus, a YouPower spin instructor, and an organic chemistry peer tutor. 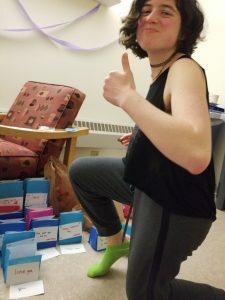 This entry was posted in Midd Blogosphere and tagged Student Leader Profiles, Student Stories on May 11, 2018 by William DiGravio. MiddR.O.C. stands for Middlebury Refugee Outreach Club. MiddR.O.C’s community partner is a Burlington area non-profit, R.O.C. Inc. The group focuses on fostering college readiness for high school New Americans in all R.O.C. affiliated programs. To learn more about MiddR.O.C., visit their MiddLink Page. This week’s Student Leader Spotlight is Mikayla Hyman ’20, the founder of MiddR.O.C. Why should folks join your org? What will they take away from the experience? Folks should join MiddR.O.C. if they want to interact with people from other cultures mentor high school students! Mikayla Kyman ’20 prepares goody bags as part of MiddR.O.C.’s Valentine’s Day fundraiser. Why did you first create MiddR.O.C.? I created MiddR.O.C. because I visited a program for refugee students in Burlington, and I realized this was a service that they wanted but was not being provided. Also, I thought it would be loads of fun! What has been your most memorable experience as a member of MiddR.O.C.? Probably meeting the students who inspired the creation of this club; they were so excited to hear about the life of a college student. What have you learned, either about yourself or the world around you, as a member of MiddR.O.C.? I have learned how to keep my eye on the objective and be willing to pivot from an original goal if new information comes up. I had to make sure that my first priority was always to the refugee-background students I was serving. That focus was not always easy to maintain, but it was important that I did. I’m from Long Island, New York, and I am an Anthropology major! I am also involved with the Youthful Alliance of Merrymaking, Hillel, Chellis House, and the Pre-Medical Society. This entry was posted in Midd Blogosphere and tagged Student Leader Profiles, Student Stories on April 11, 2018 by William DiGravio.